This is the second fitting on my navy three-piece suit from Chittleborough & Morgan. As with any tailor I try for the first time, I encouraged Joe (Morgan) to cut and make a suit to his style. It was interesting to see the differences from other tailors. The first difference is rather large: the lapels. Joe, harking back to Tommy Nutter days, likes a sweeping peaked lapel, and they rather dominate the jacket. 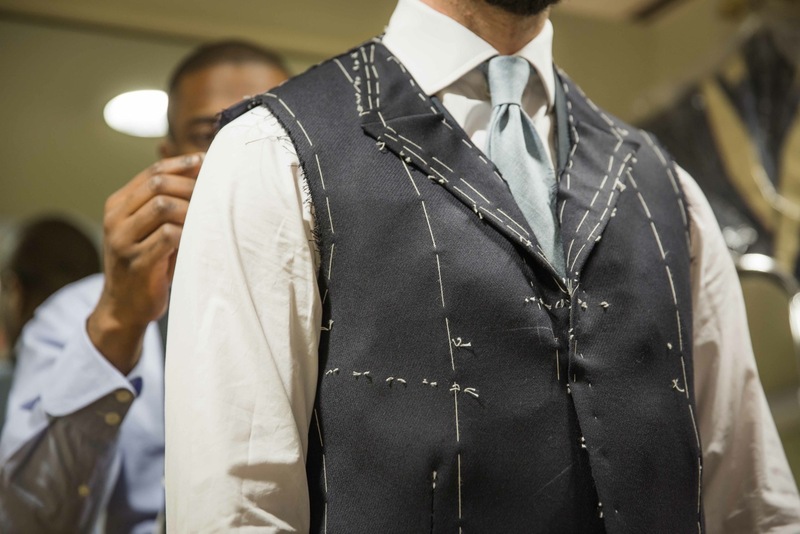 The collar is high and tight to the neck as well, partly to balance the lapels. 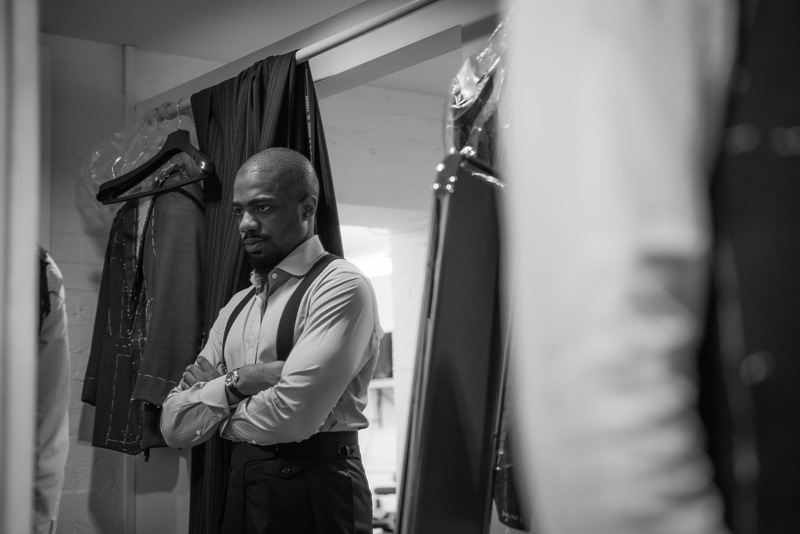 This extreme style stops it from being a business suit. But it will make it perfect for cocktails in the evening, with a white shirt and white handkerchief. 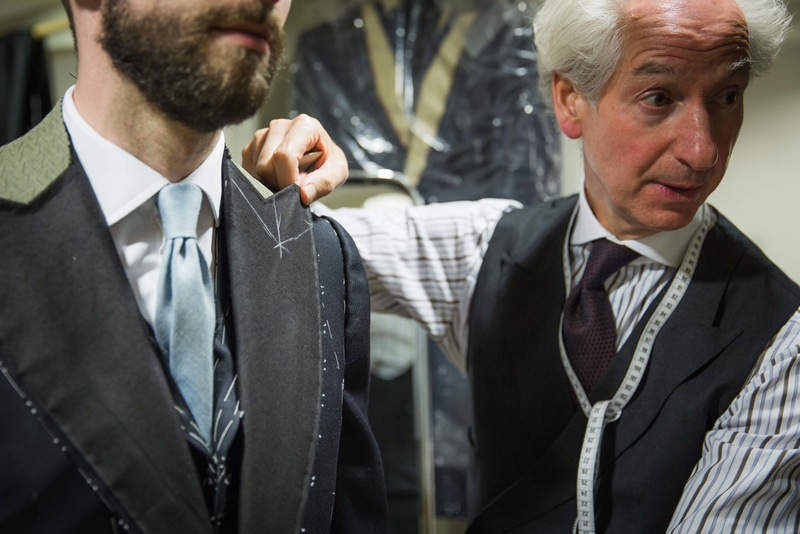 And the waistcoat on its own will be very suitable for the office. I have written many times about the benefits of a waistcoat in the office, and Joe’s cloth back and Milanese buttonhole make this waistcoat look more like a jacket than any other. We will probably have two pairs of trousers to facilitate that multi-functional use. In fact the most beautiful part of the suit is probably the transition from waistcoat to trouser. 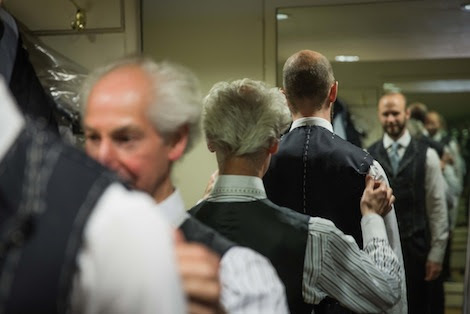 The way the points of the waistcoat run into the trouser pleats, lying flat against the cloth, is just lovely. Few changes were made at my prompting. 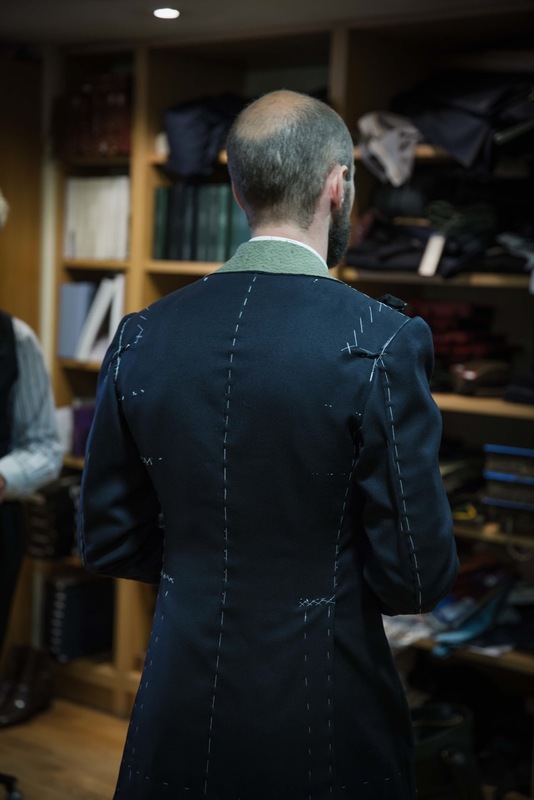 This is still essentially a basted fitting – Joe likes a lot of fittings – and these are for the tailor rather than the customer. Next time we will get to the finer points of style. For now, Joe and Michael (Browne) tinkered with the front balance and got used to quite how sloping my shoulders are. It often seems like it would be quicker to start from the vertical and work up. Other points to notice: the lovely line of the trouser, fitting as flat to the thigh as is possible with double pleats; the close fit around the seat and small of the back; and the long, elegant skirt. You can follow the discussion on Chittleborough & Morgan suit: Part 2 by entering your email address in the box below. You will then receive an email every time a new comment is added. These will also contain a link to a page where you can stop the alerts, and remove all of your related data from the site. What is the difference between a close fit and a tight fit on the seat? Around two milimetres. Or comfort when sitting. And here are the artists at work!Nice! What we see already looks promising. Thanks for sharing, Simon. Two quick remarks, though: 1. Pleats on the trousers? have you changed your mind? 2. Are the vents not long? 1. I usually have pleats on high-waisted trousers. They need room for the hip bones. Not on regular trousers, which sit on the hips. 2. The vents start at the same place, but the jacket is a little longer than average. Thank you for this interesting report, Simon. You wrote: “This extreme style stops it from being a business suit.” I guess C&M upon request also make business suits as well or will their coats always be longer and have these impressive lapels? 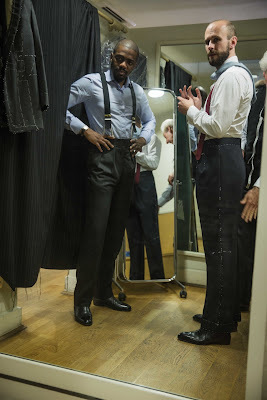 You also write that Joe Morgan likes a lot of fittings. Why is that and what is a lot? Absolutely, they can make to lots of styles. They will always have more edge than most other suits, but it will be very subtle. I don’t know how many fittings yet, but only one or two more than most people I’m told. Simon, what tie is that you’re wearing? 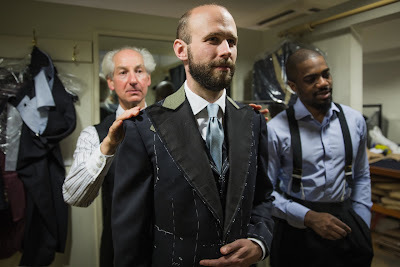 Fantastic article Simon, I really appreciate how many tailors you frequent and that you let them have a go at making a Jacket in there style, at least for the first one. Gives those who either because of geography or economy may never have the chance. One question what are the differences between a pair of trousers cut to be worn with Braces vs those without? If you have already gone over this please point me in the right direction otherwise it may provide inspiration for a future article. Brace-cut trousers tend to be slightly looser in the waist – because they don’t require tension in the waist to keep them up. They also often have a fishtail back, which mine don’t have here. And they tend to be cut with a higher rise, but again not always. how many bespoke suits do you own? I think about 18, jackets and suits. Plus two overcoats. The trousers definitely look very sleek about the seat, but shouldn’t they be about a quarter-inch longer, so they don’t appear to float so much above the shoes? Michael Browne’s trousers in the last picture seem to be closer to the ideal break. 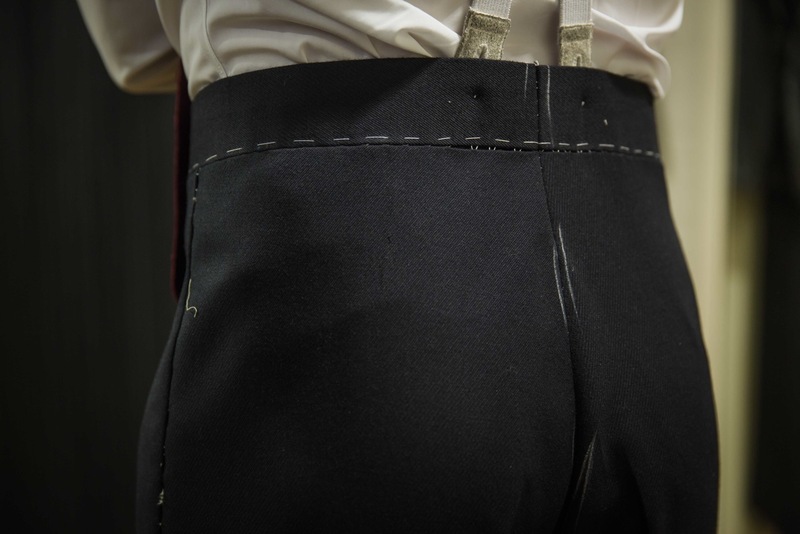 And while you don’t have a full fishtail back to the trousers, did you consider a small break in the waistband at the top to provide a little give as you sit down? The lapels are really quite extraordinary: I would consider them excessive, like the massive fins on 1950s cars that would overwhelm the entire car. I agree with you about the trousers. They can easily be lengthened of course, with the braces, but will likely also be altered slightly. I’ve never found such little breaks in the trousers to make much difference to comfort. I completely take your point about the lapels, though bear in mind that the black canvas you can see is not the actual size they will be at the end. It will be a good half inch less all around the edges. Simon. The whole look is fantastic. Have you chosen lining yet? I only go for matching linings these days. That has a lovely silhouette to it. I also like the turnback cuffs of the tailor’s shirt; VERY nice. Do you intend eventually to use every tailor on the row Simon? Experiences at Kilgour, Nortons and Richard James (bespoke) would be very interesting additions. No, not really. The more you try the more tired you get of working with a new cutter to get your pattern right. I only tried Joe because his style is so unique. Too much emphasis is also put on the brands of tailoring houses. It’s more about the cutters, and they move around. Kilgour, Dege and Nortons would not be that different to others I have tried on the Row. And Richard James would be interesting from a design point of view, but not cutting.